The inevitable moment has arrived. 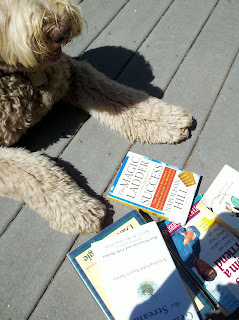 I've collected a small stack of self-help books on Success. I had to, after all. Research. The thing is, I'm not sure I'm ready for them. I'm afraid. What if, when I open them, I discover that everything I'm writing about has already been written in them? More important, what if, when I read them, I learn that I actually possess some quality that would eliminate the possibility of my success. What if I fail the checklists? I know they're going to tell me I have to have faith in myself, or some similar pablum. Well, hello? Need I say more? And then there's the other fear, the one I really don't want to admit to my tens of readers. The fear that after reading these books, I will become an INSUFFERABLE self-promoter with a falsely inflated ego. You see, I am suggestible. I know that. I've read some self-help books in my time. Louise Hay? I've affirmed. Julia Cameron? I've tried to believe in G.O.D. and ask the universe for whatever I need. Once, I borrowed a guided relaxation/self-improvement tape from a housemate who was relentlessly pursuing escape from herself. In the tape, I had to picture myself in a lovely place, yadda yadda, picture myself relaxing in a comfy seat in this lovely place, yadda yadda. Then I had to imagine a young child coming into view, approaching my maturer self, and offering a gift to the older me. The tape told me to accept this gift. Well, I pictured, for some reason, the young child handing me a gold ring, and then, although the tape didn't tell me to, swallowing it. Strange, I thought, I am swallowing this symbolic gift from my symbolic inner child. Hmmm. Nevertheless, I felt one hundred percent relaxed afterwards. Later on that day, I told a friend who happened to be a very religious Christian about this experience. She said that I had to be careful with these sorts of visions, because the Devil can come to people that way. Now I don't believe in the Devil, but I am suggestible. I was disturbed enough by her reaction to mention it to the professional I was then seeing twice a week. Dr. B, a nice, Jewish professional in a beautiful house in Weston, MA, laughed--laughed, at me-- and said, "You're very suggestible." If your shrink tells you that, you know it's true. So am I ready for Dale Carnegie and that guy who wrote The 7 Habits of Highly Effective People? I think I have more prep work on my own definition before I swallow theirs. Hi, I found you on She Writes and I saw that you had posted about finding success. Today I put up a post on failure as a means towards success. Since you are very suggestible, I suggest you check out my blog: http://allthingsaudry.blogspot.com. I enjoyed your perspective about the self-help books and I'm always worried about becoming a shameless self-promoter. And yet, here I am promoting my blog - yikes!